There are lots of really interesting pieces of Whitby folklore. We’re going to share some of our favourites with you. Every year on Ascension Eve, a penny hedge is built in Whitby on the banks of the River Esk. This is one of Whitby’s oldest traditions and has sad origin. Over 800 years ago, three landowners were hunting a boar. The boar, in its efforts to escape, sought shelter in a chapel cared for by a local hermit. The hermit shut out the hunting dogs from the holy space in an effort to save the wounded boar. The boar did not survive the wounds it had suffered from the hunting party, who were angered with the hermit’s intervention. They ran at the hermit with their hunting weapons, causing fatal injuries before fleeing the scene. The hermit was forced to drag himself away from the chapel in search of help. He was rushed to Whitby but his wounds were too great. Before he died, he declared that he would forgive the men if they agreed to carry out a penance. They had to agree; else they’d have lost their lands and perhaps even faced execution for the murder of the hermit. The Penny Hedge is that penance. On Ascension Eve, 38 days after Easter Sunday, the men had to put up a hedge in the harbour. 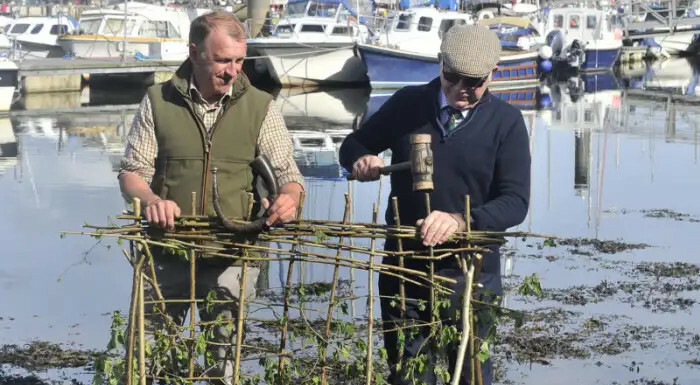 This hedge needed to be strong enough to withstand three tides and be made from wood cut down with a knife that only cost a penny. If the hedge failed, they would lose some of their lands. The tradition of the penny hedge is still carried out in Whitby today. If you’re in town on Ascension Eve, you can watch the hedge being built by locals at 9 o’clock in the upper harbour. Image from Whitby Gazette 2018. Picture taken by Richard Ponter. The mummified hand of glory is on display in the Whitby Museum. It’s the only known surviving hand of its kind and has a dark history. Stories of hands of glory can be found all over Europe over the last 400 years. It was believed that the hand could aid other thieves in their nightly activity. By cutting off the right hand from a felon’s body as it still hung from the gallows and carefully preparing and pickling it, thieves could create a powerful tool. There are many different accounts of the powers that a hand of glory would grant the holder once the fingertips, or the candle held in the hand, were lit. Some believe the light would only shine for the holder, leaving others in darkness. Other accounts say that the hand would make anyone else in the house fall into a coma they couldn’t wake from until the flames were extinguished. Another tale states that the fingers wouldn’t light if there were people awake in the house to allow the thief to know they might be caught. Any locks would reportedly open in the vicinity of the hand and the flames had the ability to burn forever. The flames of the hand of glory are also thought to be incredibly hard to extinguish. You can’t blow them out or use water, only blood or milk are able to put out the fire. Any of these reported powers would be incredibly valuable to a thief. Make sure you visit the Whitby Museum to see the hand for yourself. The Mulgrave Estate is an absolutely lovely place to stay, full of creature comforts and luxury, with a great expanse of woodland that you can enjoy wandering around. But, if you do, make sure you don’t disturb Jeanie Biggersdale. Jeanie, known as the hag or fairy of Hob’s Cave, does not like to be interrupted by visitors to the wood. She’s thought to put curses on the people who trouble her, but it’s not known why she’s so angered by interruptions to her solitude. The ire in her voice was enough to make the farmer flee. He turned his horse and galloped away, but Jeanie was hot on his heels. The farmer knew that his best chance of escape was to cross the nearby stream, for Jeanie cannot cross running water. He drove the horse on, and as the two leaped over the water, Jeanie caught up. Jeanie slashed the horse in two. The farmer, luckily for him, landed on the other side of the stream and was able to get away. So, if you do go for a walk in Mulgrave woods, make sure you avoid angering its resident fairy. Before the Staithes became the gorgeous fishing town we know it as today, a great storm hit the village settlement that sat next to the water. That storm was so strong, seasoned sailors were forced to return to land to wait out the weather. So powerful were the waves that night that even the two mermaids became trapped, unable to control which way they were swimming. They were thrown onto the land where they fell into an exhausted sleep. When the mermaids woke, they were horrified to find the villagers had captured them in nets. They pleaded that they meant the village no harm and were just trying to find a safe place to wait out the storm, but the humans would not believe them. The mermaids were kept prisoners for months. Some of the villagers threw stones at the strange creatures, while others took pity on them and passed them food. After a while, the appearance of the mermaids stopped startling the villagers and people began talking to them. One day, when talking to a local fisherman, the mermaids were able to charm him into freeing them from their bonds. They took the opportunity and fled back to the sea. The residents have never seen the mermaids in their waters again. As Henry VIII built up the Church of England, he worked hard to destroy Catholic sites of worship. Between 1536 and 1541, religious buildings all over the country were wrecked, with all their valuables taken to generate income for the Crown. Whitby Abbey was no exception. His men ruined the Abbey and removed the church bells. King Henry wanted the bells to be transported to London where he could sell them on. The people of Whitby were devastated. They hoped that something would happen that would keep the bells in their town, far away from London. Their wish came true. After carefully transporting the bells down the 199 Abbey steps, the ship that was supposed to take them away sank. Local fishermen tell that you can still hear the ringing of the Whitby Abbey bells underneath the waves just off the Black Nab in the North Sea. We hope you’ve enjoyed learning a little more about Whitby folklore. If you’ve got any stories to share, please get in touch.